Some NFL players continued to protest during the national anthem on Sunday, after President Trump repeatedly criticized the league for its handling of the demonstrations. Kansas City Chiefs linebacker Ukeme Eligwe sat during the anthem while cornerback Marcus Peters kneeled, CBS affiliate KCTV journalist Tom Martin reports. 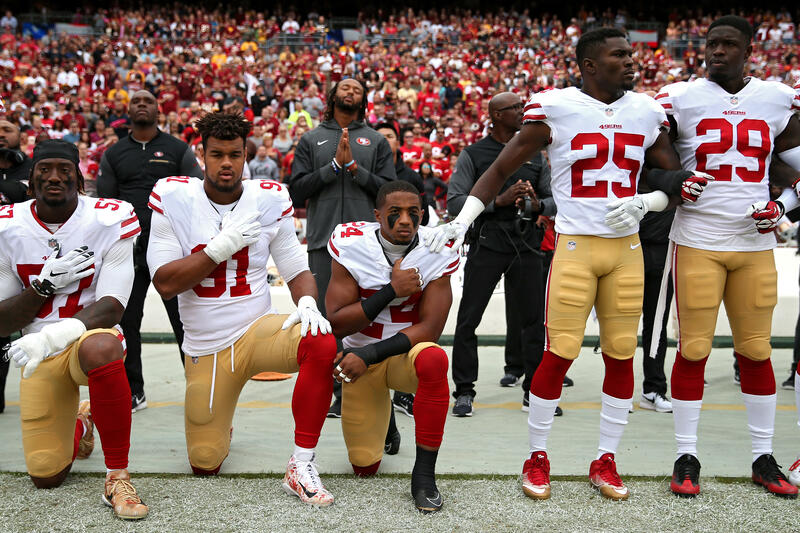 Seven San Francisco 49ers kneeled during the anthem Sunday. Those players were safeties Eric Reid and Adrian Colbert, linebackers Dekoda Watson and Eli Harold, receiver Marquise Goodwin, defensive lineman Arik Armstead, and cornerback K'Waun Williams, according to ESPN. Miami Dolphins players stood for the anthem while wide receiver Kenny Stills, safety Michael Thomas and tight end Julius Thomas remained off the field. The trio previously knelt during the anthem, but Dolphins coach Adam Gase implemented a policy requiring all players to stand, the Sun-Sentinel reported. Most New Orleans Saints players knelt before the anthem played on Sunday. ESPN reports that all the players then stood while the anthem played and that some locked arms. The team was met with boos as they knelt -- and cheers as they stood up. Last week, a letter from NFL Commissioner Roger Goodell to team owners circulated in the media. It discussed a possible rule change that would force all players to stand while the anthem plays. The email drew praise from Mr. Trump, who tweeted: "It is about time that Roger Goodell of the NFL is finally demanding that all players STAND for our great National Anthem-RESPECT OUR COUNTRY." The NFL, however, disputed the president's comment without naming him, saying in a statement Wednesday that "commentary this morning about the Commissioner's position on the Anthem is not accurate," and that there would be "discussion of these issues" at an upcoming owners meeting.